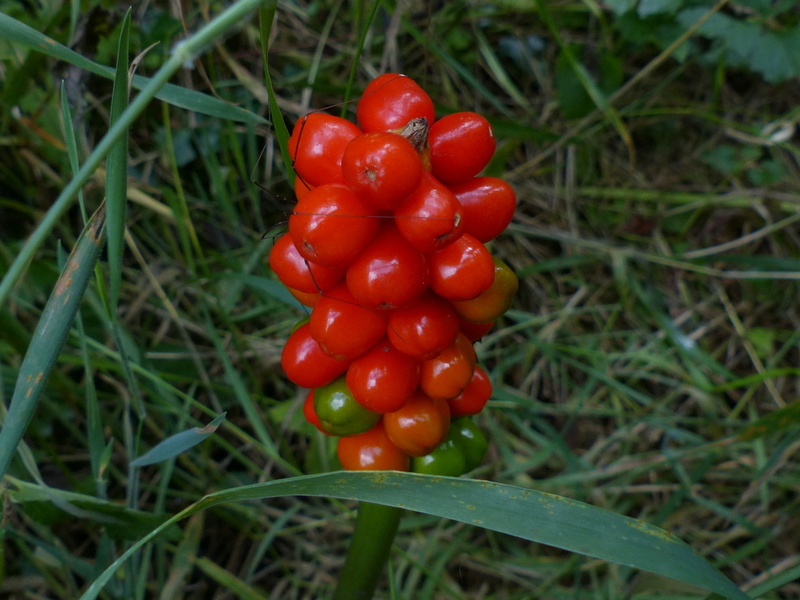 Arum maculatum has many names, you may know it as Lord’s and Ladies, Cuckoopint or the Arum Lily. 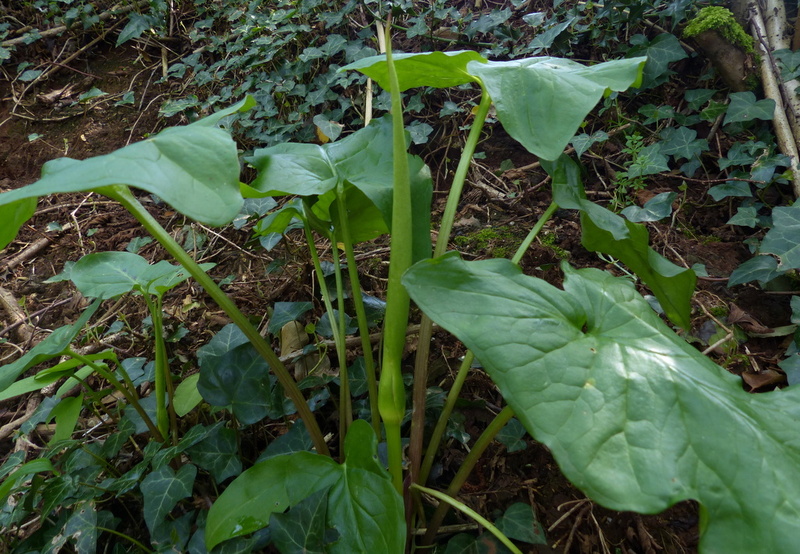 The first thing that you should know about Wild Arum is that it is poisonous. 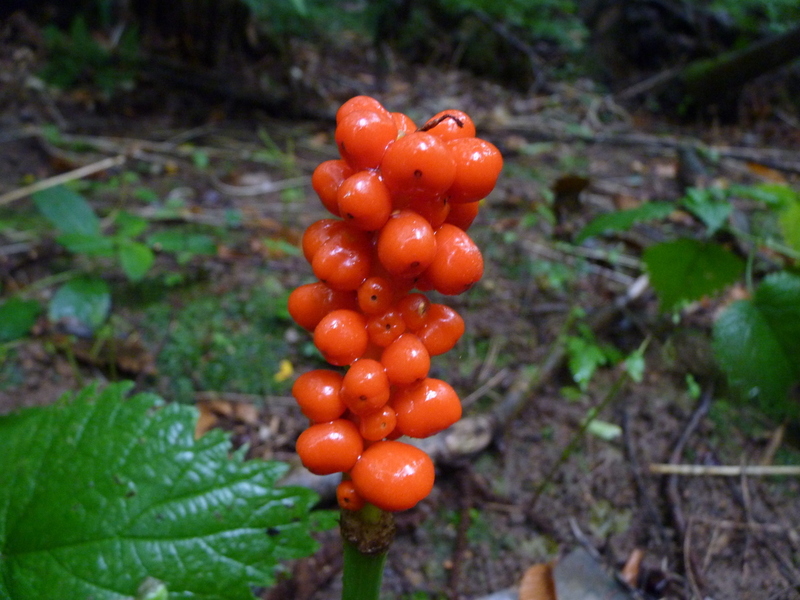 The berries are particularly bad but all parts of the plant contain sap that burns and blisters. 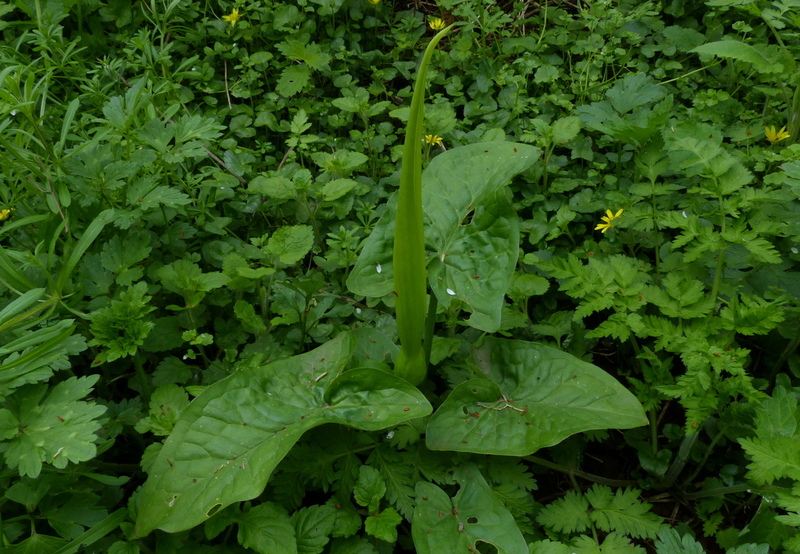 It hurts the mouth and so there are very few serious poisonings, the first reaction is to spit it out. 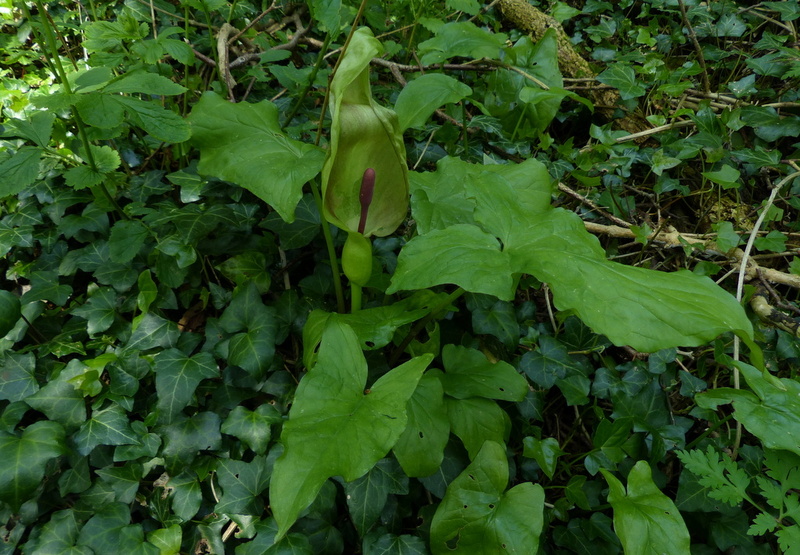 To put that into perspective, in the UK during a four year period from 1996 to 1999 there were 23 visits to hospital as a result of Arum poisoning, none of them resulted in serious harm and in a study from Switzerland there was only one serious incident reported over a 29 year period. 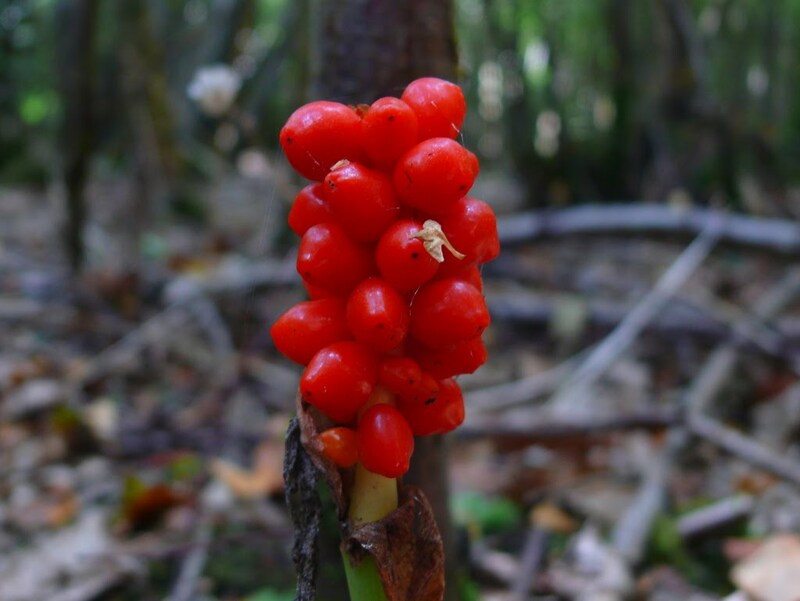 If you were able to eat the berries they could kill you. 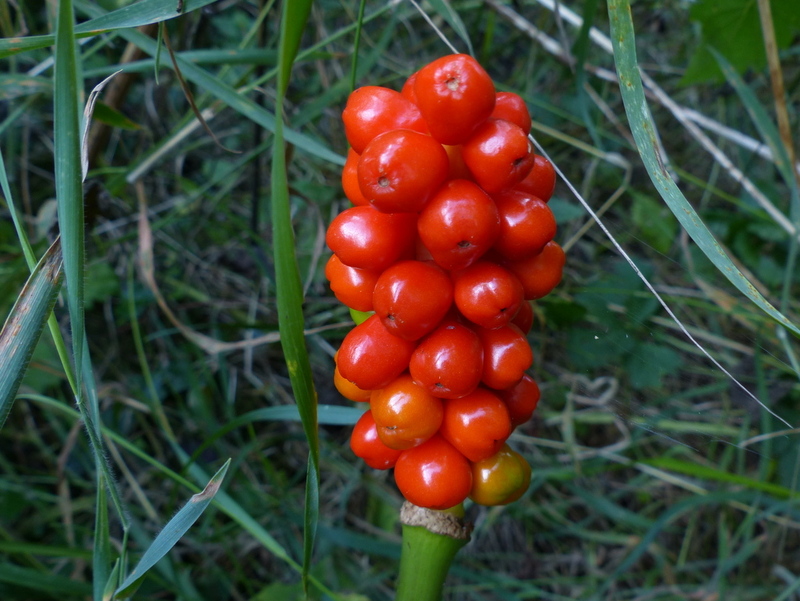 It is deadly but hard to swallow. 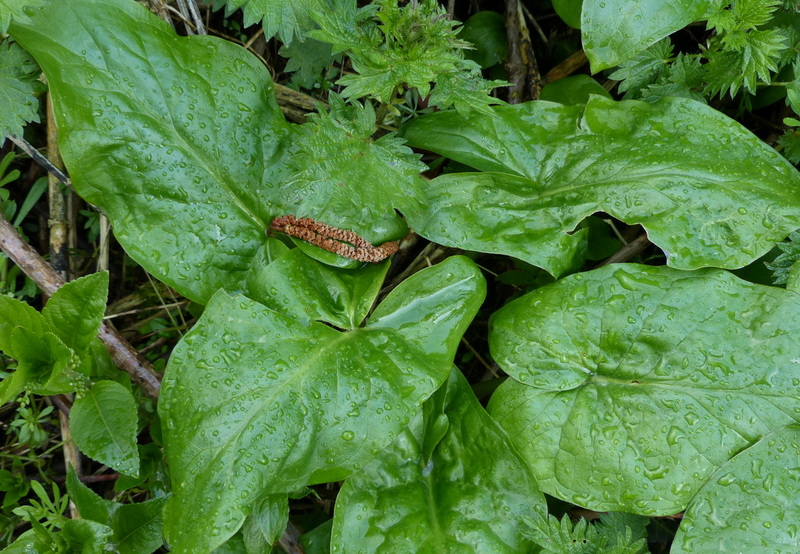 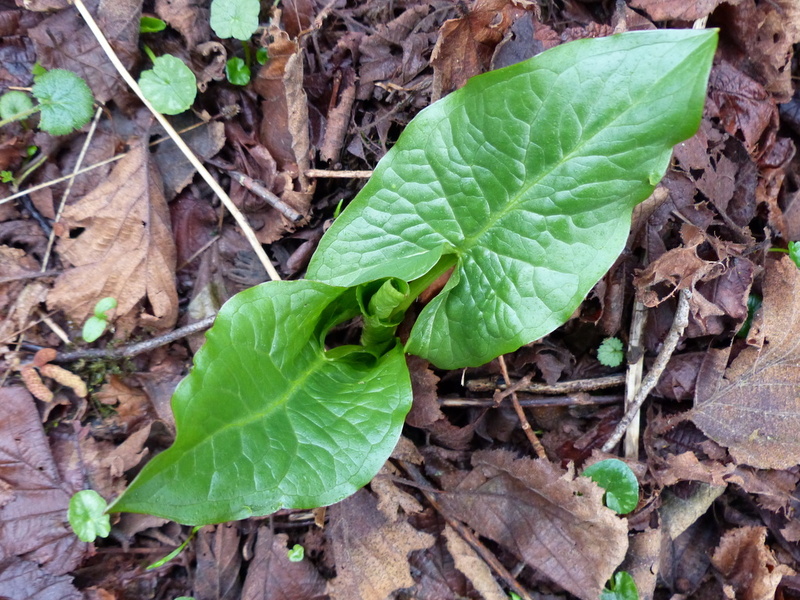 As a sometime forager this concerns me as I often find Arum leaves nestling in amongst my favourite spring greens. 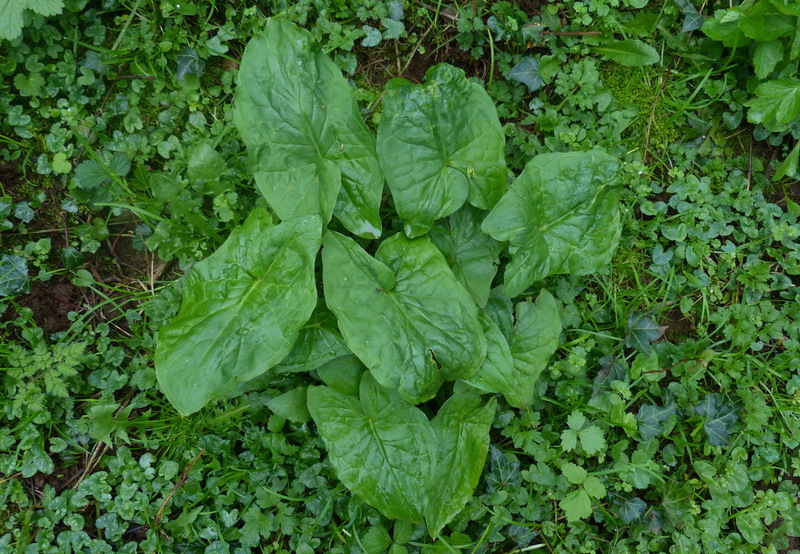 I would not expect to die from picking these leaves but I could end up with a very unpleasant sandwich. 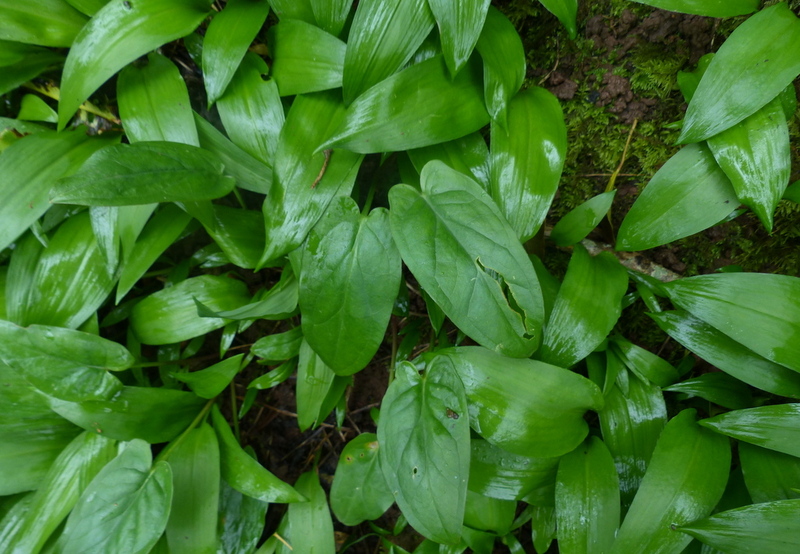 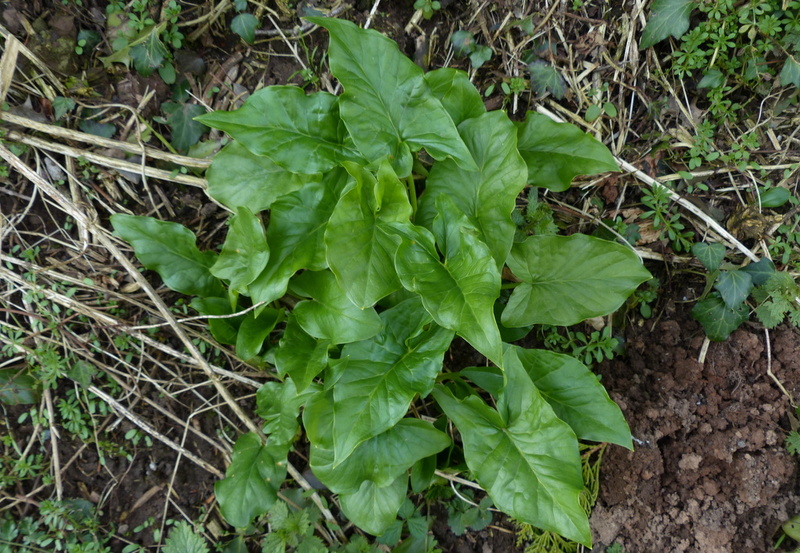 These are Arum leaves growing in a patch of Wild Garlic. 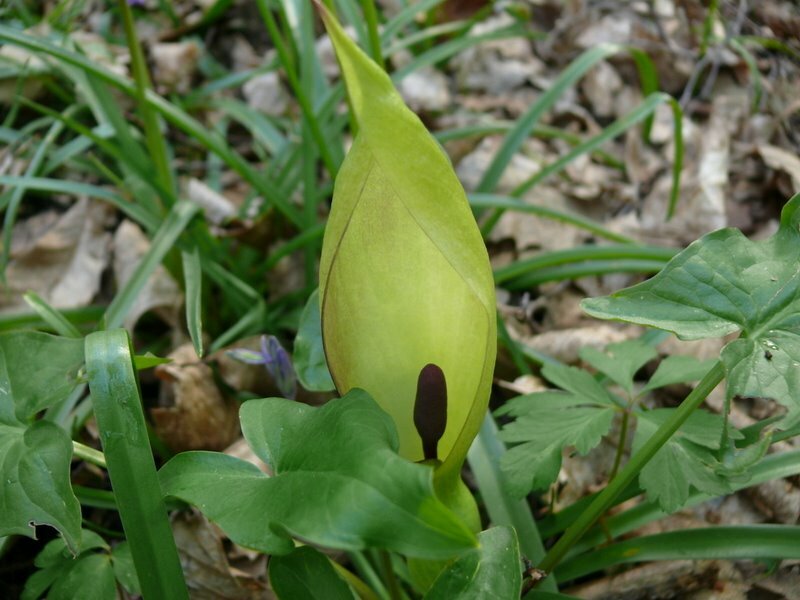 The leaves appear early in February and it is not until the end of April that you see any kind of flower so for a long time leaves is all there is. 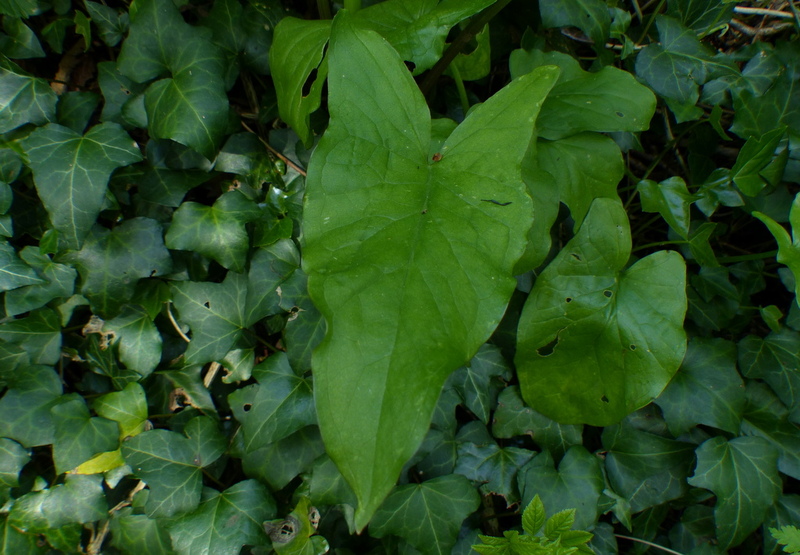 It is a good idea to be familiar with the leaves. 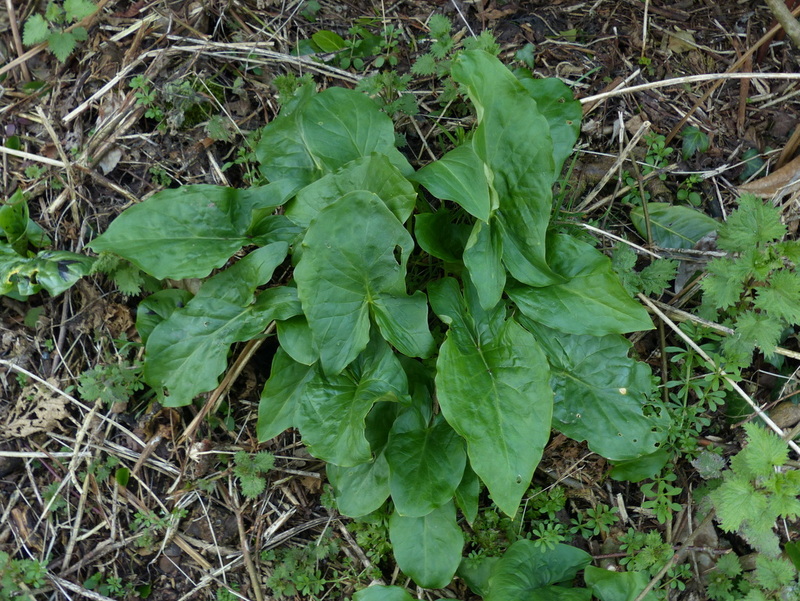 Towards the end of April the curled up spathes start to appear. 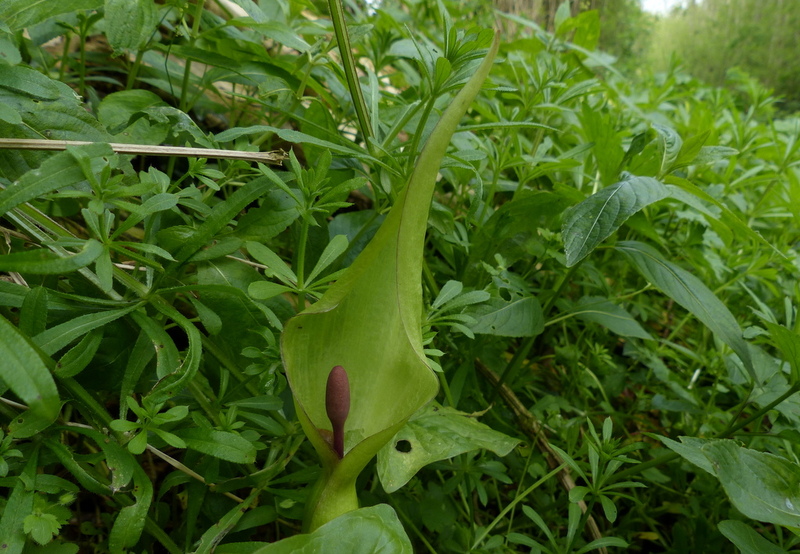 These are not really the flower of the Arum Lily but they are where you would expect to find the flower. 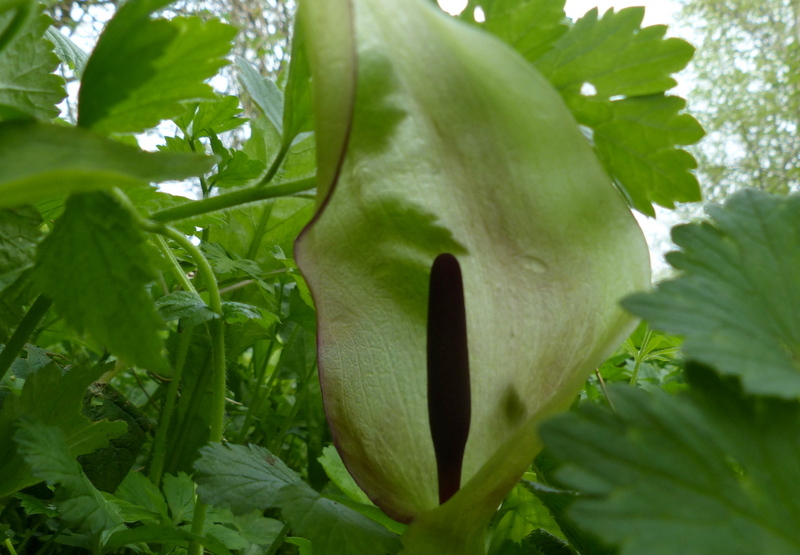 This is what emerges from the Arum Lily. 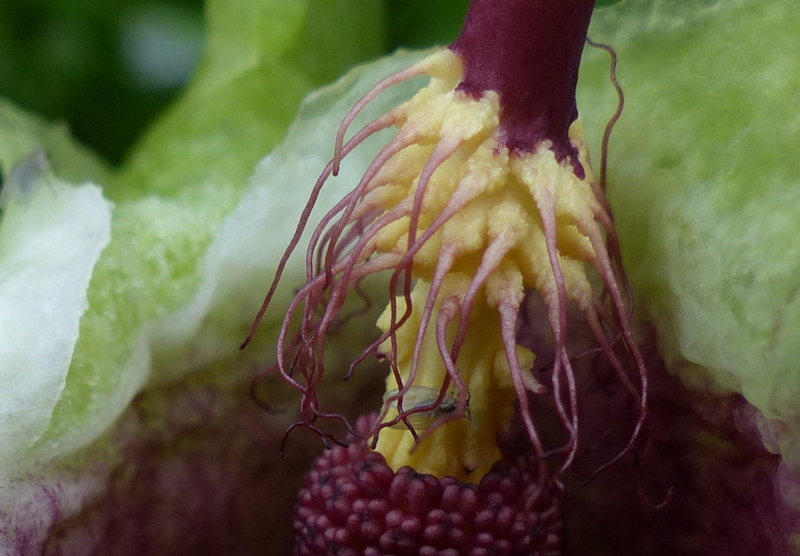 Not a flower, it is an elaborate fly trap. 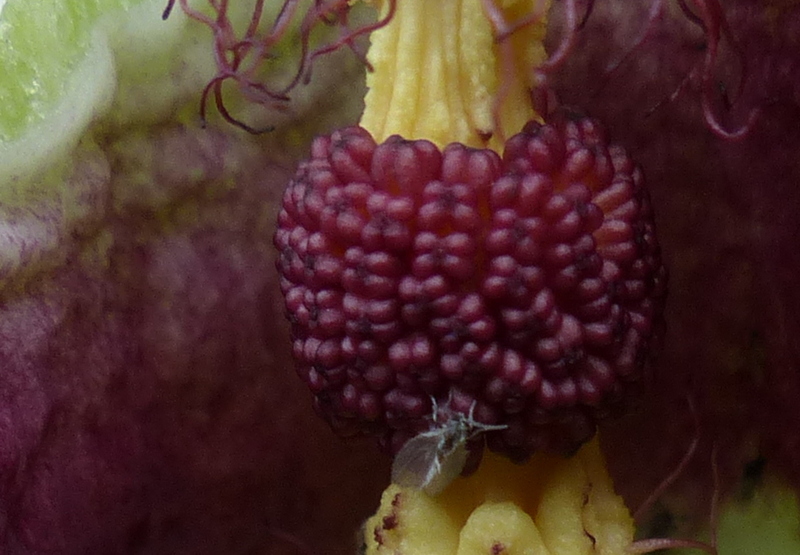 The flowers are concealed inside of this structure. 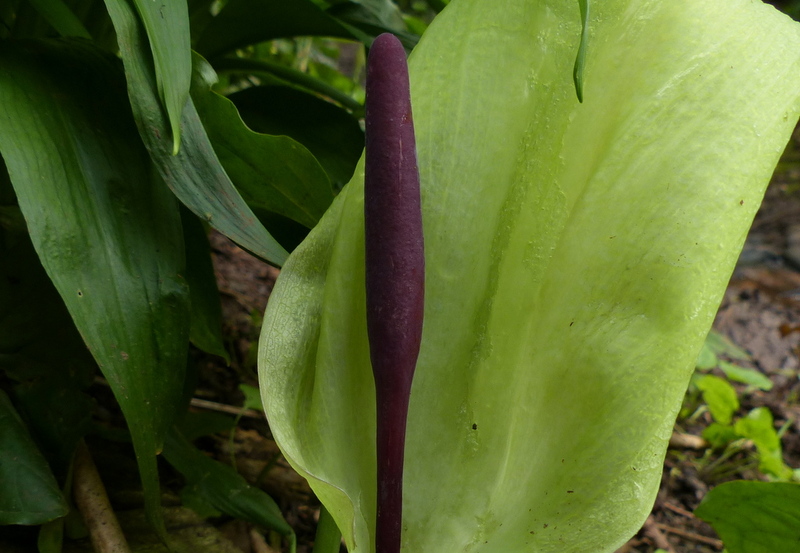 The visible parts are the purple central spike, called a spadix and the green leaf like structure that wraps around it, called the spathe. 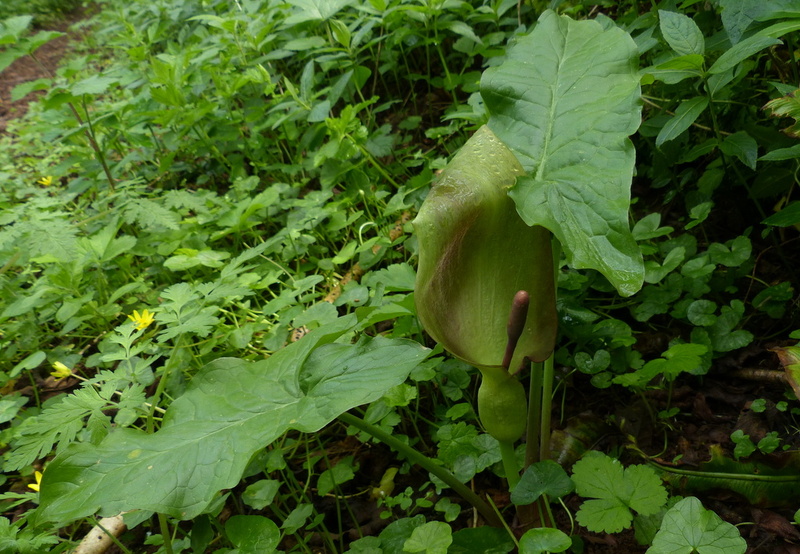 The purpose of the spadix is to attract insects, particularly an Owl Midge called Psychoda phalaenoides. 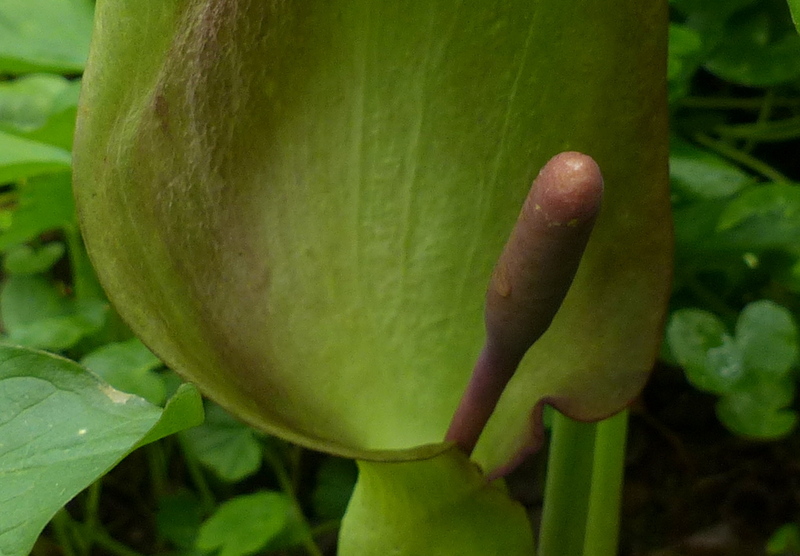 It emits a smell to attract the flies. 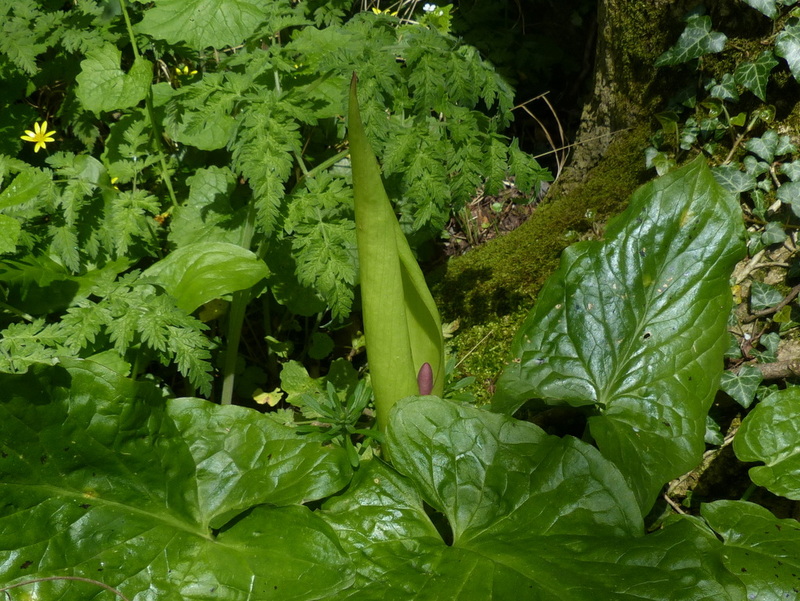 It is also able to emit heat raising the immediate temperature by as much as 15 degrees C.
The Spathe serves to entrap the insects once they have been drawn in. 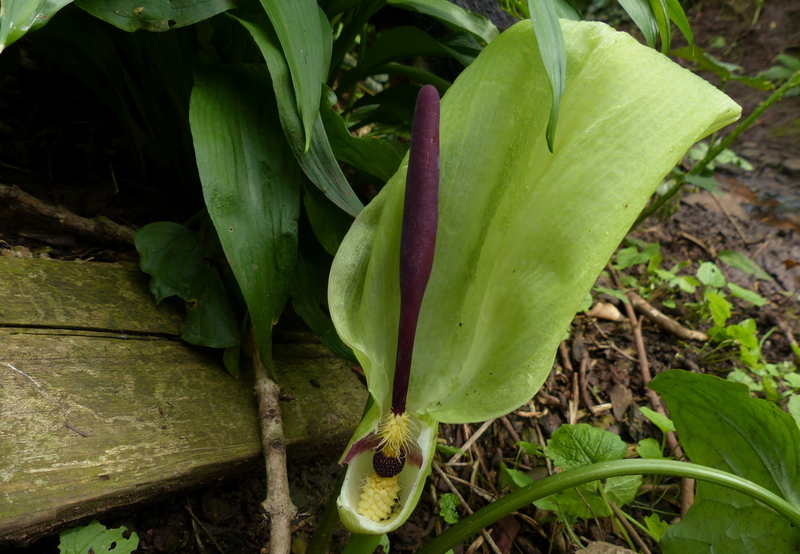 The spathe is also slippery and the flies fall down into the trap below. 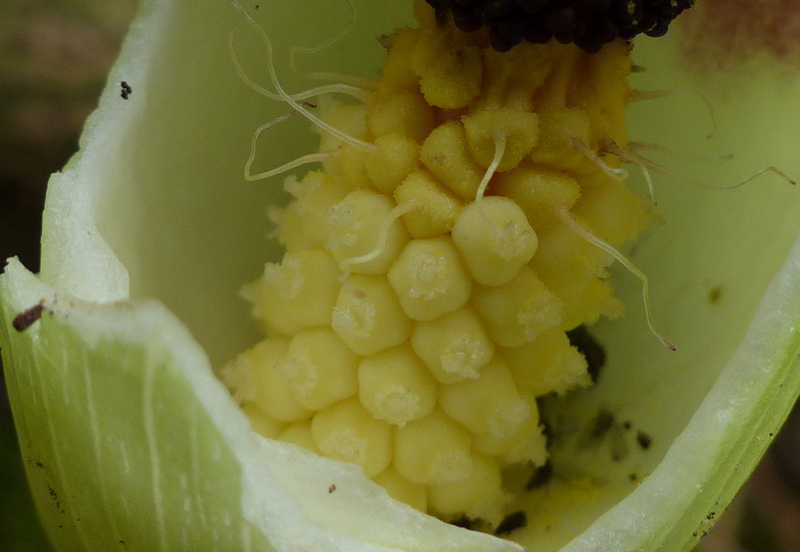 At the base of the spadix and totally enclosed by the spathe are three different types of flower. 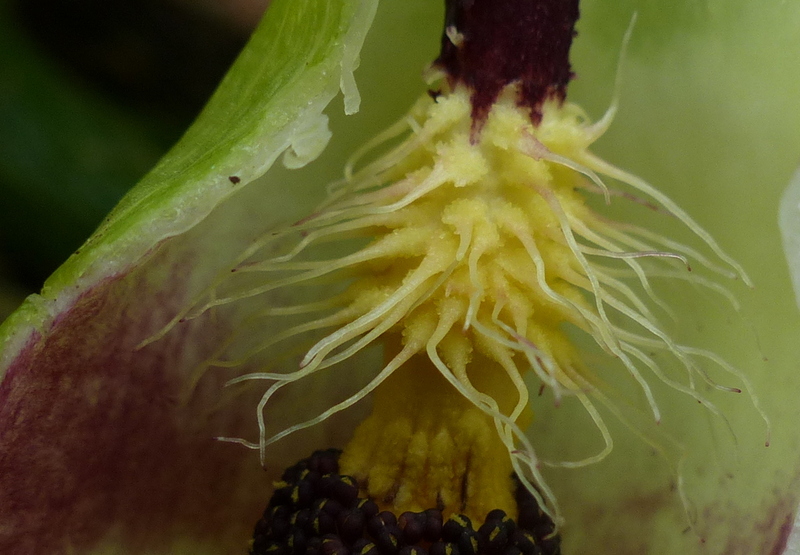 At the top of the trap there is a cluster of hairs derived from sterile male flowers. 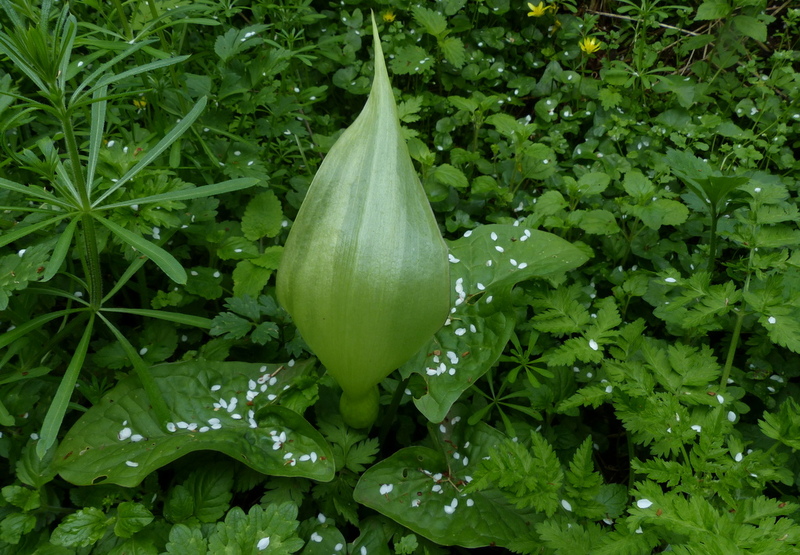 It’s purpose is simply to block the flies escape. 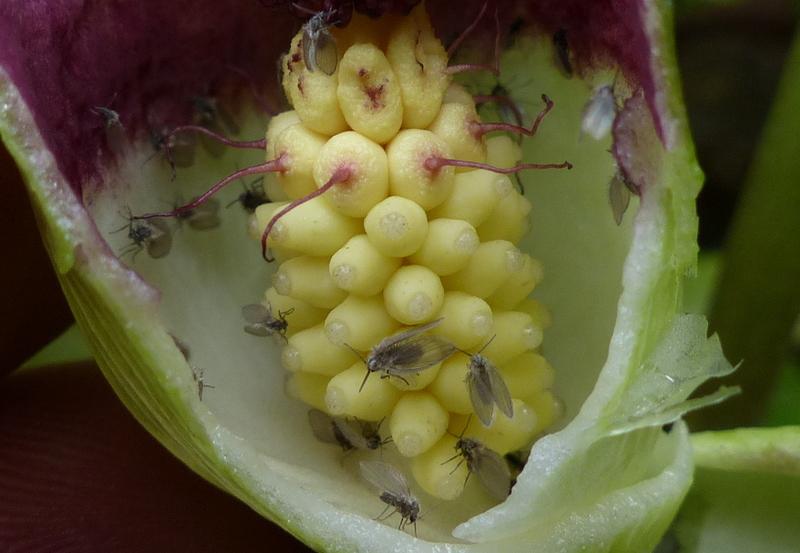 When the plant has finished with the flies these hairs will wither releasing them to take pollen to another Arum that will put them in a new trap and use them just the same. 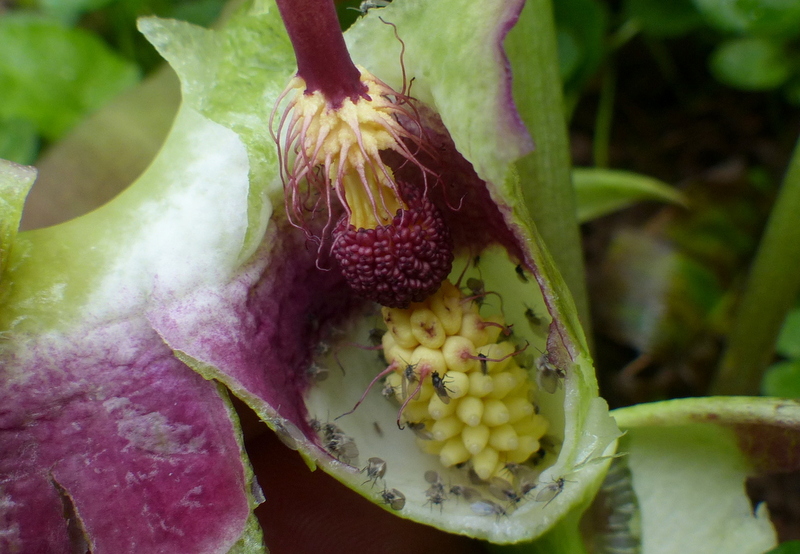 The important seed producing female flowers sit at the bottom of the trap welcoming the flies with their fresh pollen. 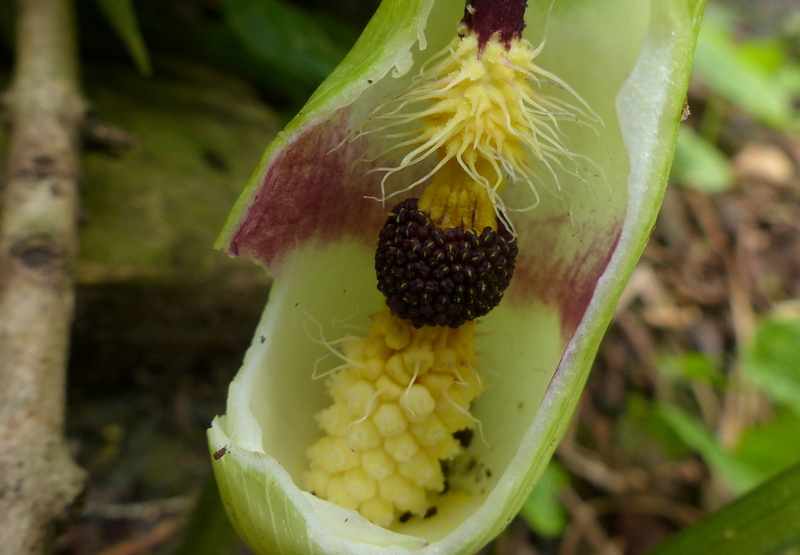 These flowers will become the spike of bright red berries that remain when the spathe and the rest of the spadix have withered. 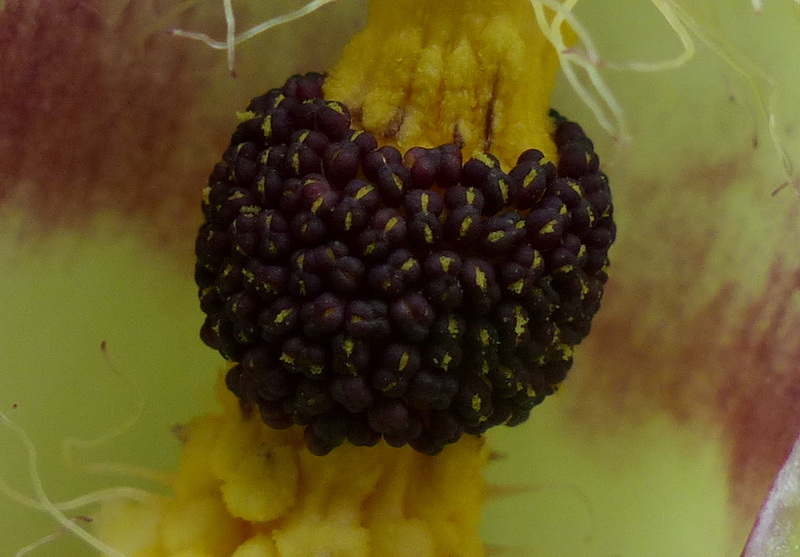 Between these lie the pollen producing male flowers. 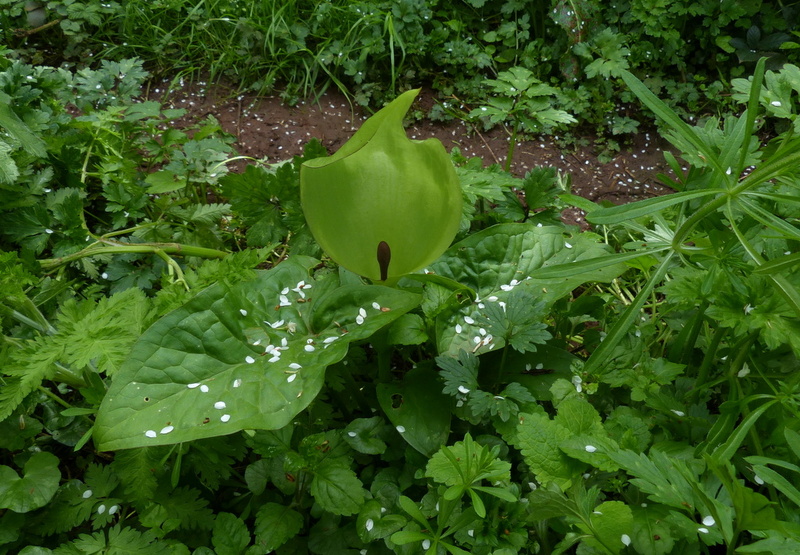 Once the female flowers have been pollinated the male flowers will release a dusting of pollen over the flies, the hairs above will wither and the flies will be released from the trap to find another Arum to pollinate. 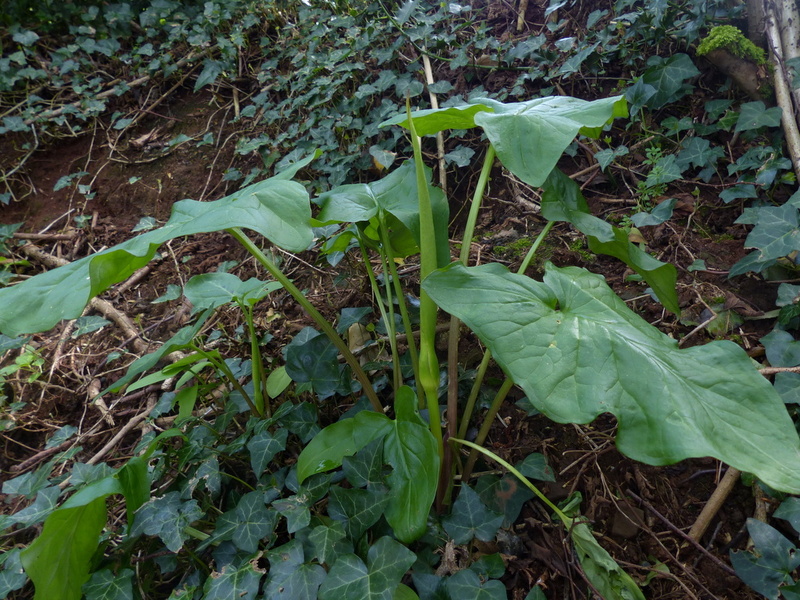 Now the leaves and the spathe wither and die, all that remains are the female flowers which will grow to be the spike of fruit. 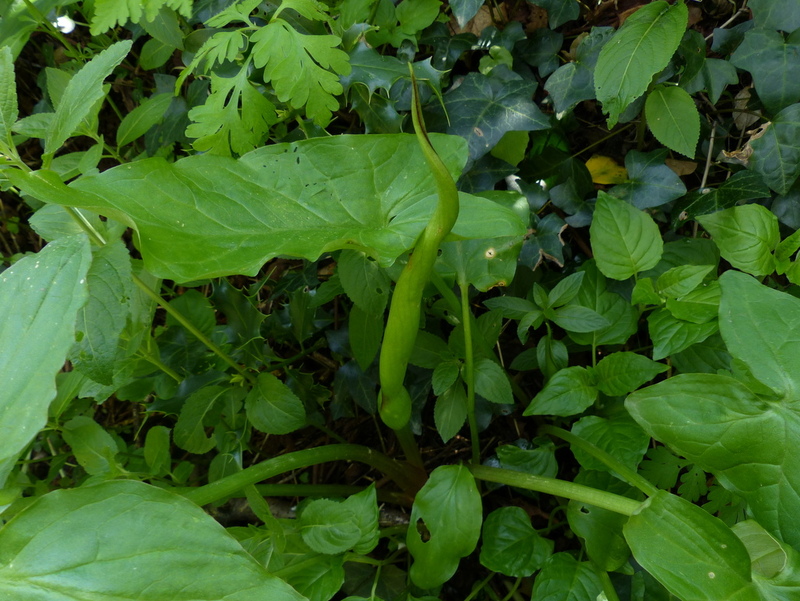 They will start off green and by August they will ripen into a stick of bright red berries. 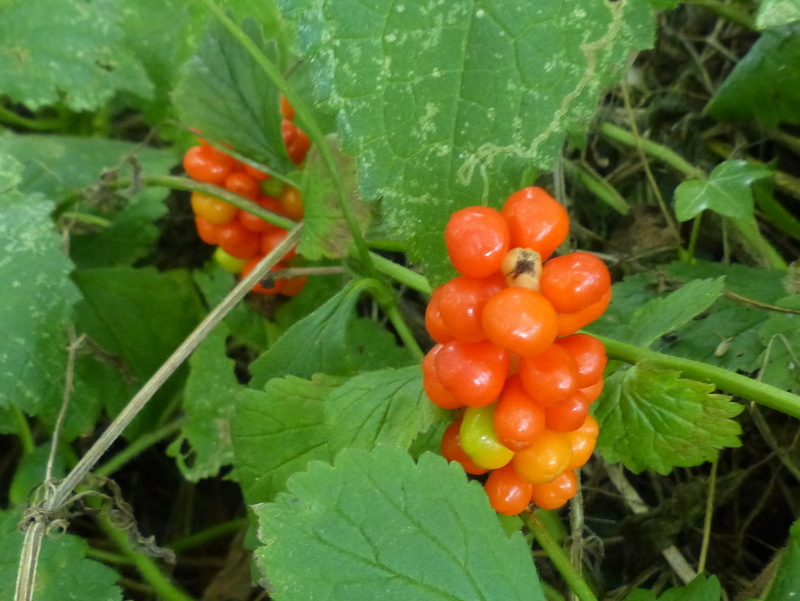 The fruit is eaten by birds and particularly by pheasants, of which we have quite a few around here. 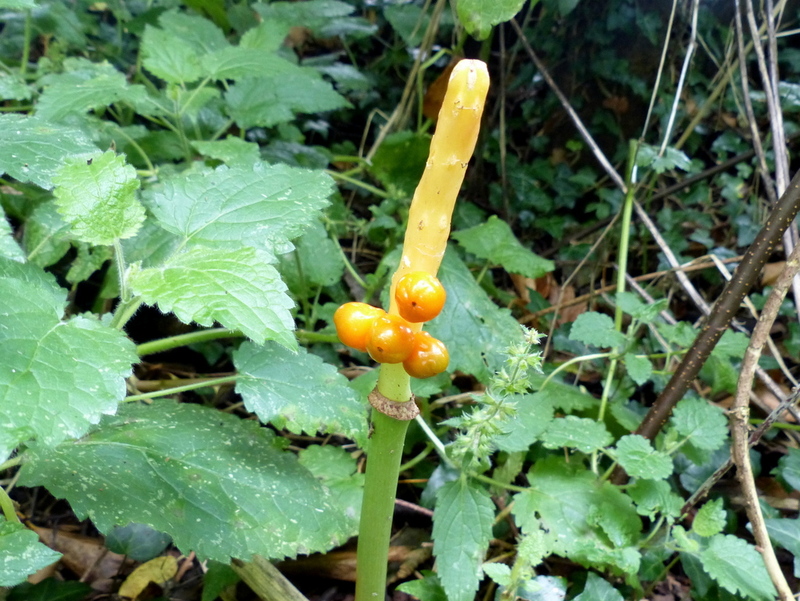 It is not uncommon to find almost completely devoured stems.